Adventure seekers from around the world say skydiving is the ultimate thrill. What better place to experience human flight for the first time than with an experienced instructor on the “Garden Isle” of Kauai? 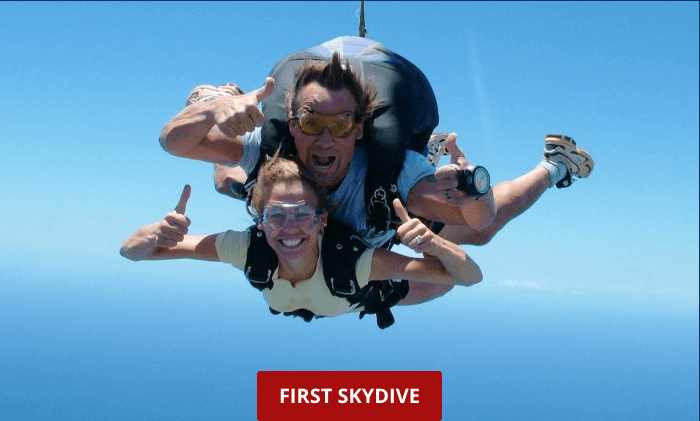 At Skydive Kauai, our top priority is to make everyone feel relaxed and comfortable, especially for the first-time participants. To prepare for your first jump, we’ve compiled some tips for one of the most amazing thrills you will ever experience. After arriving at Skydive Kauai, you will be paired with one of the company’s highly-experienced United States Parachute Association (USPA) certified instructors, who will remain with you from the time your plane lifts off until your feet are firmly on the ground. Once your plane lifts off, your feeling of excitement will no doubt rise with the altitude. When you are close to jump altitude, you’ll receive your goggles and your instructor will guide you towards the door. When the plane reaches the 10,000-foot jump altitude, the door will open. When you and your instructor exit the plane, you will then know what all the hype is about … flying like a bird at 120 mph! Remember to open your eyes! The views you will see are only seen while skydiving over Kauai; so, don’t miss the opportunity to take it all in. When it’s time for the freefall to be over, you will experience the beauty of flying your parachute. For five to seven minutes, you’ll be awed by the breathtaking island- and ocean-scape stretching out below as you fly towards the landing area. You did it! Our final recommendation: decide ahead of the jump to have your dive recorded on video so that you can relive the experience over and over. Whether this first jump is a single bucket list experience, or you decide you just can’t get enough, you’ll be glad you have a video in remembrance of your first jump.